The bell signals the end of learning for another day. Students make a rush for the door, and the temptation to join them is overwhelming. You sit down at your desk and dream of the dawn of a new tomorrow. A tomorrow with no bells; no lesson plans; no marking; and no report-writing. When you are a teacher, the lines between day and night are blurred. Three o’clock signals the end of learning for students, and the start of paperwork for teachers. It’s going to be another long night. Before you start tomorrow’s planning, today’s marking screams at you. 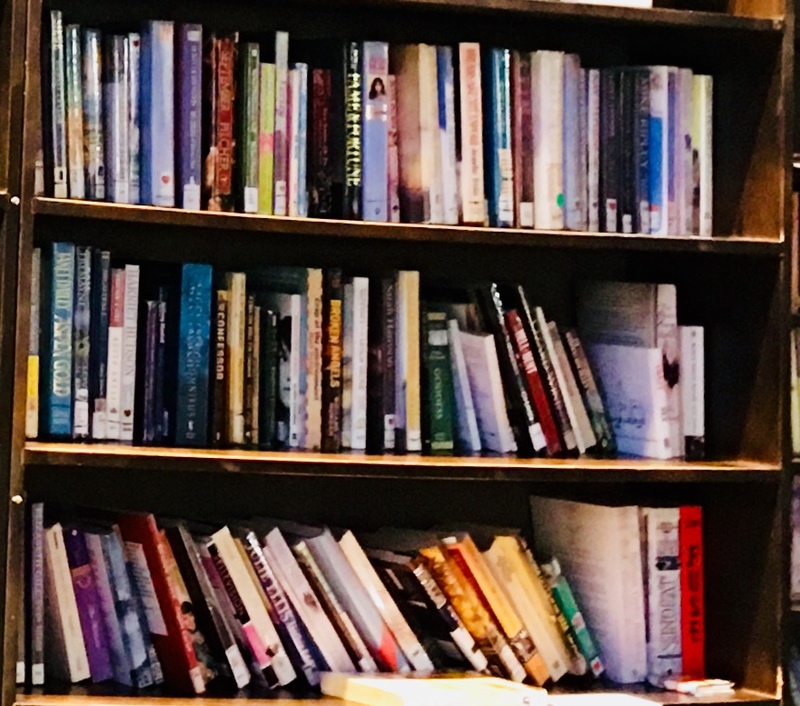 Thoughts are sloshing around your head – and they need to find their way into the books to be marked, before they settle into a pool of useless, random words. Leaving the marking until later never ends well. So you open the first book, pick up your pen – and start. Your stomach reminds you that playground duty kept you from the staffroom, for yet another lunch break. Along with the empty feeling in your stomach, you crave coffee. Another one of life’s simple pleasures that eludes you in your teaching day. Hot coffee and students don’t mix – Workplace Health & Safety posters adorn the staffroom walls. No chance of forgetting. You make a mental note to stop by the coffee shop on your way home. The teaching weeks roll into teaching months. Before you know it, you’re beyond retirement age, but you are still on the treadmill. Love for your job, and dedication to it, are no consolation for the tiredness you feel. That weariness that chases you down at the end of each long day. Your non-teaching friends are in bed at a reasonable hour – you are up late, planning and writing reports. It takes its toll. Your health starts to flash warning signs – Enough is Enough! And one day it all comes to a grinding halt. The plans you made to keep working until your seventies, not that you are too far from that magic number, disappear. You wake up one morning and think “I can’t do this anymore”. And that’s the day the resignation papers fall out of your pocket – onto the Principal’s desk. When I closed the classroom door for the last time, I didn’t have time to think about it too much. As soon as I made the decision to fill in the retirement-forms – I booked a cruise. I needed something to separate my working-life from my new retirement-life. And I needed something to console me in the raw days following my departure from the world that had absorbed me for more than half my life. I poured myself into planning for the cruise from Sydney to Singapore. That trip was to close the door on my working life – sealed shut – never to be reopened; and it worked! I came home refreshed, renewed and excited about settling down into a normal life. The years of getting by on less than eight hours sleep had become stuck somewhere in my Body-Clock, and it wouldn’t budge. I found myself unable to put my head on the pillow before midnight – but I was still waking up at five or six in the morning. The problem was, there was no planning or report-writing to fill the evenings. I subscribed to paid television – but that didn’t work; there never seemed to be anything worth watching. I started writing. I had always loved writing and promised myself that one day I would write a book. Perhaps that ‘one day’ had arrived. The website I dabbled in, while still teaching, suddenly had meaning. It had been sitting there, half-baked, for years. Now it was time to get it into the oven. And the idea of a Blog started to gel. I’d been hearing about, and reading blogs, for a long time. The three started to overlap, then merge, until it was only natural that they would become one. And from the ashes, my Phoenix arose. My humble musings from the early days are often painful to revisit. But put into perspective, they are a yardstick by which to measure the distance I have travelled. I can see the improvement in my writing, in my website management, and therefore in my blogging. Writing within a time-frame and to a specific topic has reined in my verbosity. The challenge dictates a blog-a-day for thirty-one days. You can’t allow yourself the luxury of extra words when the clock is ticking away beside you. Well theoretically, anyway. I still need to work on the length of my blogs. And that is a work-in-progress. MaureenDurney.com is keeping me focused. 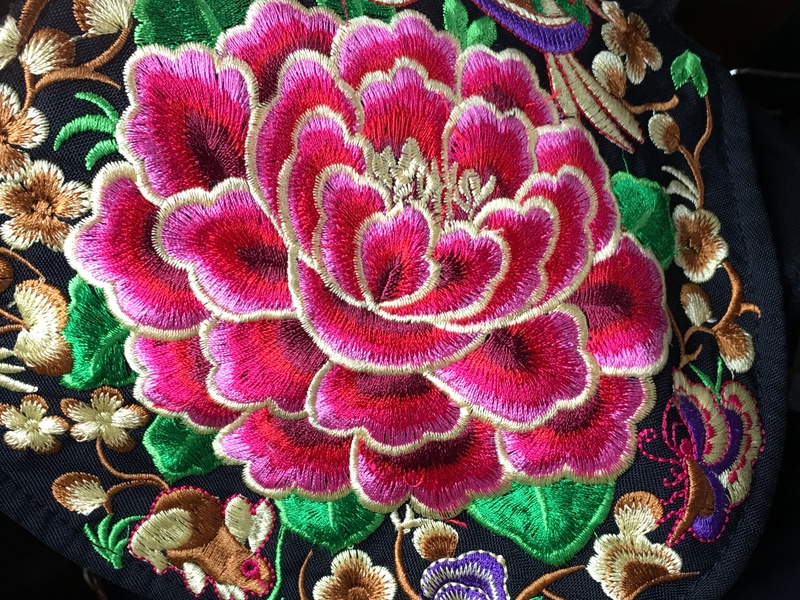 It is absorbing me – drawing out the passion that I used to pour into my teaching. It is my new life. Learning new skills is exercising my brain, just as Professional Development did in my teaching days. The book is another work-in-progress. And the Ultimate Blog Challenge is pre-requisite learning before launching full-on into it. With my long teaching days behind me, and with the dawn of my new tomorrow, I can now devote my life to Blogging. MaureenDurney.com is alive and well! Day 6 Blog Challenge – Thank You For Making A Difference! My personal experience is – ‘not nearly enough!’ And I meet people almost daily who make a huge difference in my life; I just don’t tell them that they do. Maybe in subtle ways they get the message, but they need to hear it loud and clear. Today I’m going to shout out to some people who are changing my world, one coffee at a time. I arrived in Seattle on the 11th day of December. It was cold! Probably not cold in local terms but definitely cold in Aussie terms. When I left Australia on the night of 11th of December, it was hot! No, it wasn’t the shortest flight across continents in history, or space travel, it’s just the quirky bit about crossing the International Date Line that landed me in the US of A seemingly two hours after I left the fair shores of Brisbane, Australia. But here I am in the beautiful city of Seattle, meeting some really amazing people. All have had a profound effect on me but there are some who have made a bigger difference in my life than they will ever know. This Is A Shout-Out To RedWing Cafe! Collectively, the staff at RedWing Cafe have been responsible for maintaining my sanity, and therefore the safety of others, for the duration of my holiday. 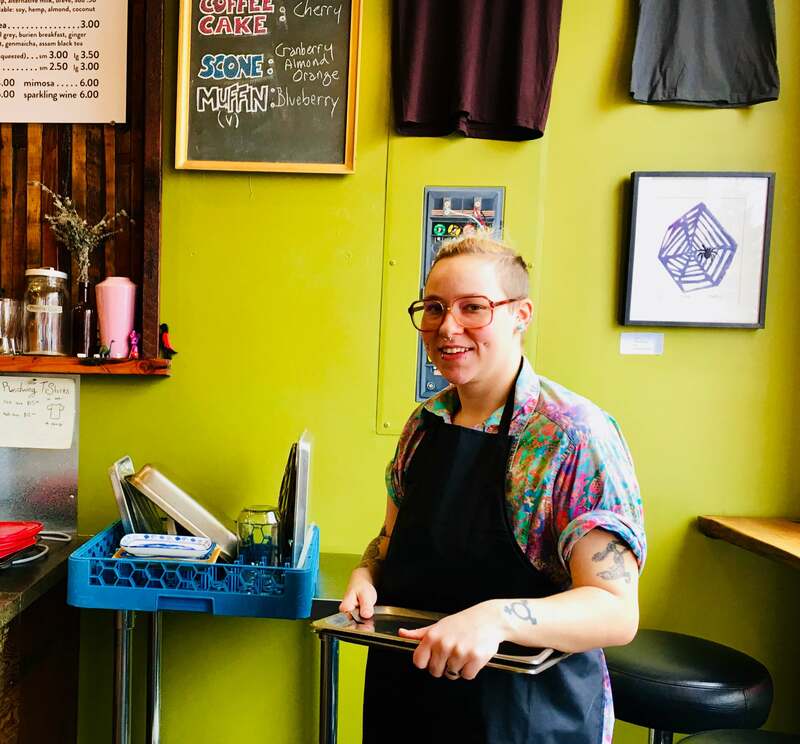 Individually, they brightened my day every time I made the twenty minute trek down the hill from 63rd Avenue S to be greeted by a warm smile, friendly hello and large Cappuccino as I walked in the door. ‘Hi there’ and ‘just give me the coffee and no one will get hurt! 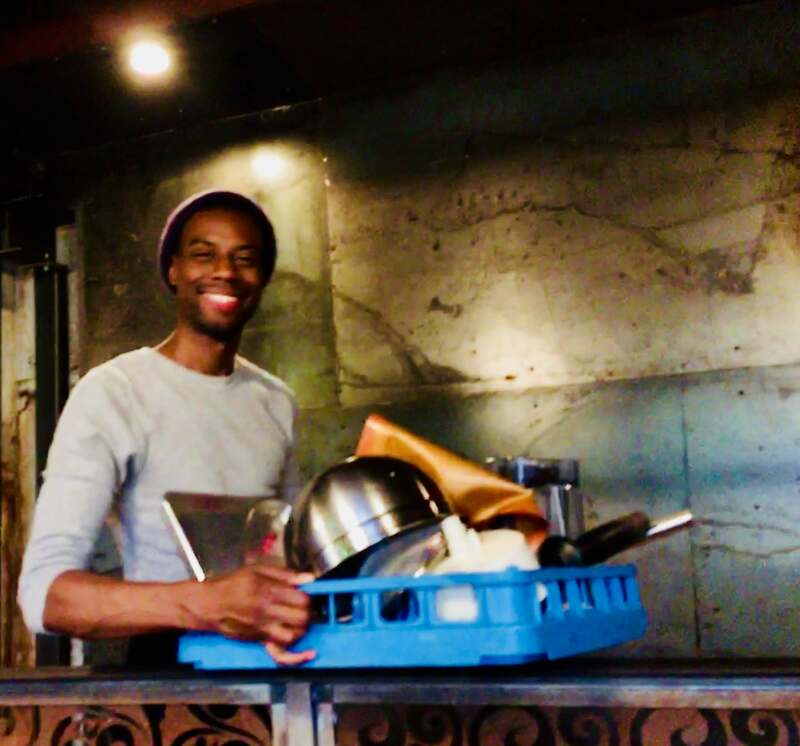 Su and Anthony brought their vision of a much-needed cafe to the Rainier Beach area at 57th Ave S. Their dream has made a huge difference to the lives of the locals who call this area home. The severity of my addiction goes beyond having a hot beverage of caffeinated liquid in either a ceramic or paper cup. If it was that easy I could simply make a cup of what is generally considered Instant Coffee, within minutes of opening my eyes each morning, and the world would be a better place for everyone. But since my discovery of the Cappuccino, especially a large one with a double shot of espresso, the instant variety is no longer a part of my vocabulary. It just doesn’t happen! There are Cappuccinos, and there are Cappuccinos! There are some that I struggle to describe in terms of real coffee and there are some that I would walk over broken glass to get to, well, almost. It comes down to how conscientious the Barista is about their craft – and believe me – pulling the perfect shot is almost an exact science. There is a little wriggle room, but not much. My heroes at RedWing Cafe have perfected the craft of pulling the perfect shot and consitently provide the ideal combination, every time. Steamed milk blended expertly with the perfect shot; what more could I ask? The Coffee Is The Best! This is a great photo of Danielle but trust me, she looks even better with a large Cappuccino In her hand; as long as it has my name on it. Danielle, you make great coffee! 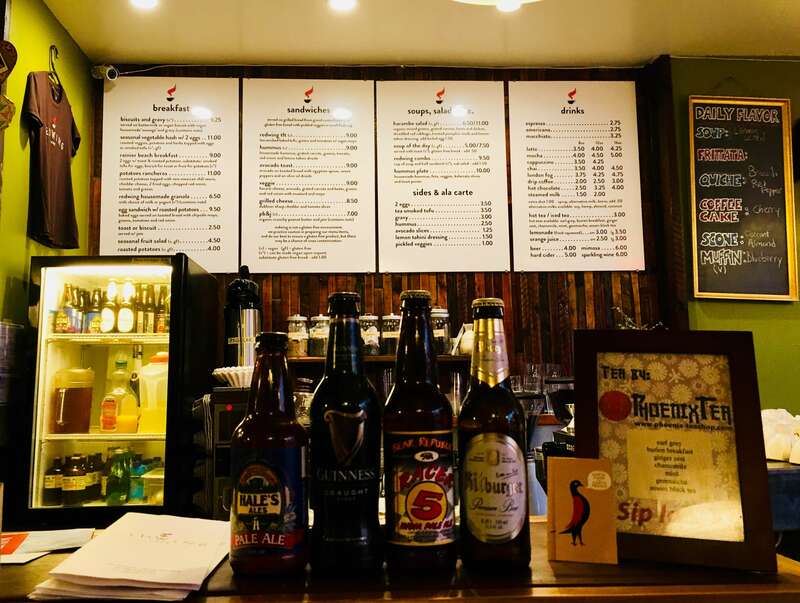 And it isn’t only about the taste of the coffee; RedWing Cafe provides the perfect place to sit, either alone or with friends, and just soak up the incredible atmosphere. 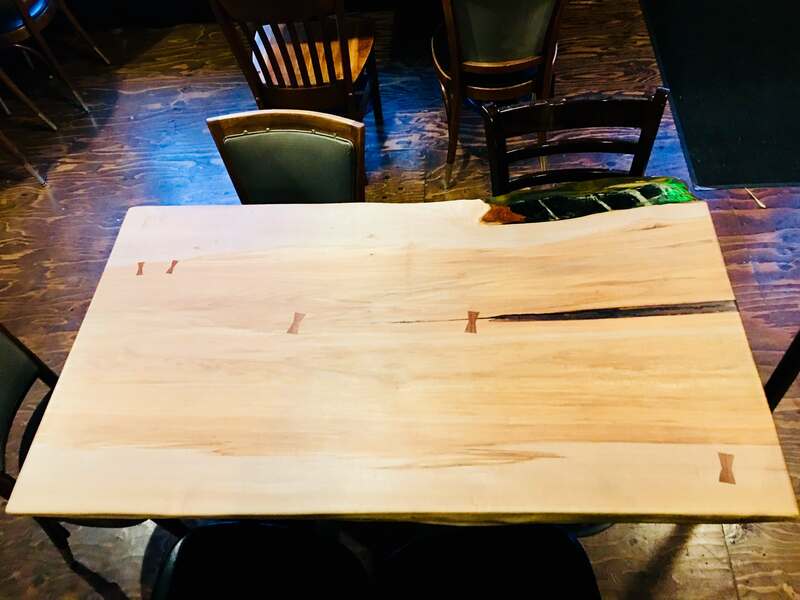 From the amazing tables lovingly handcrafted by Shawn out of a maple tree that once shaded the owner’s backyard, to the menu that specifically caters for vegetarians and vegans but is equally enjoyed by those other people (the carnivores). 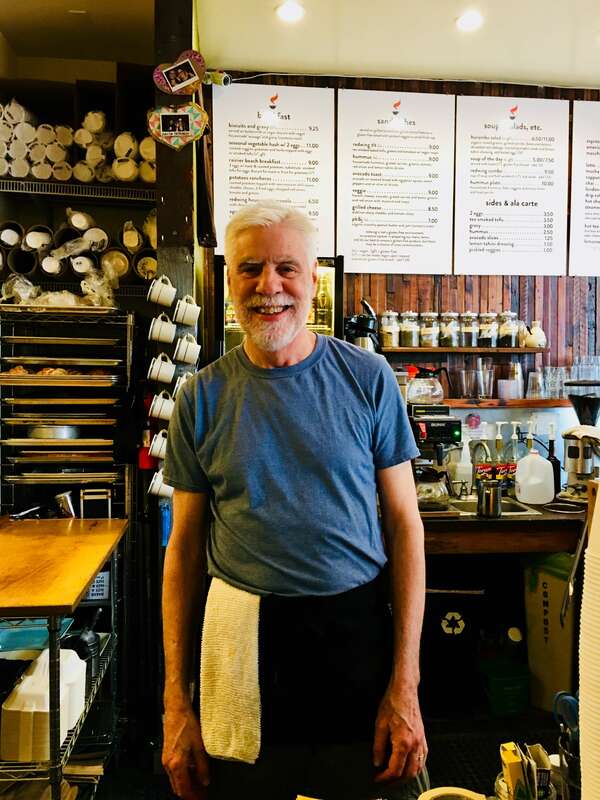 I was lucky enough to be sitting at my favourite table when Shawn called in for a coffee. His craftmanship is reflected in so much of the outstanding decor at RedWing Cafe. Warmth and comfort emanate from every table and piece of timber on an otherwise cold, wet Seattle day. 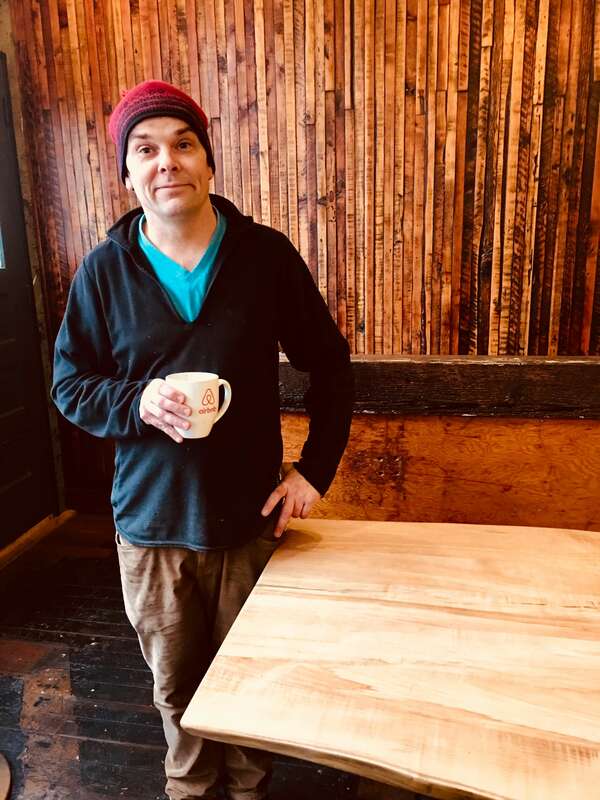 Shawn called in for a coffee and stood humbly by one of the outstanding tables he carved for the cafe. 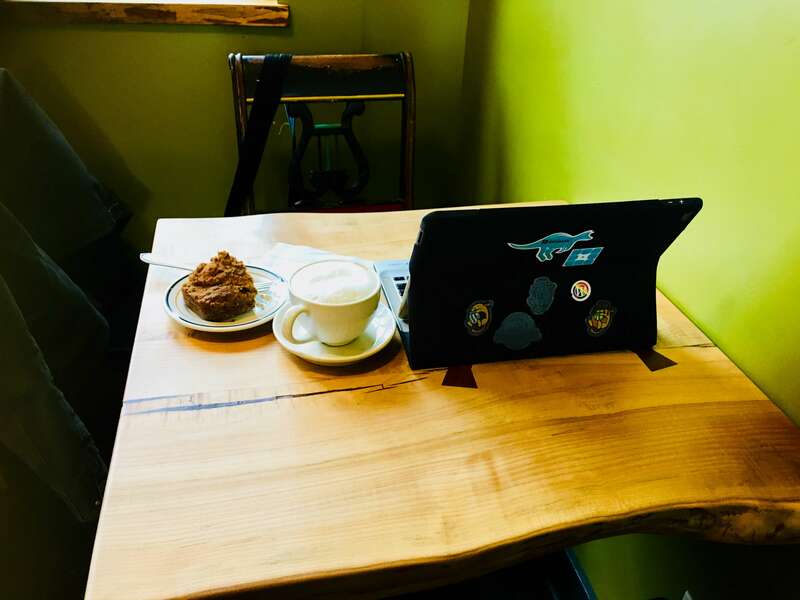 It all works to make RedWing Cafe my home away from home and the perfect place to write. My favourite writing-space is upstairs in either of the two back corners, but the downstairs section works just as well. Everyone at RedWing Cafe makes a contribution to creating the perfect place to enjoy a great coffee and spectacular food. Tyree takes care of the food department and makes the best Avocado Toast on the planet! 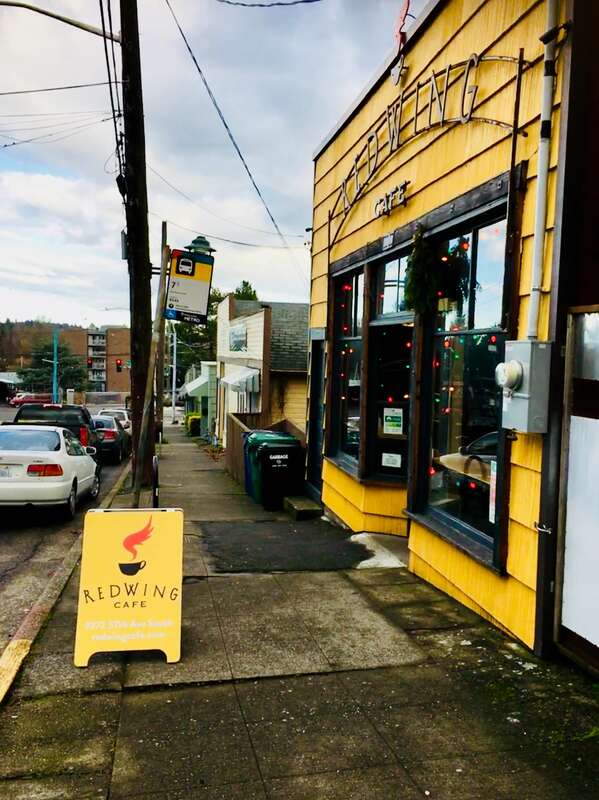 The combination of fabulous coffee, food and exceptional staff make RedWing Cafe the place to be in Seattle if you are in need of a great place to hang out. Franky keeps everything running smoothly in the kitchen and dining room. Franky, Tyree and Brett make sure hungry diners enjoy the best food, every time. Did I mention the Avocado Toast? You really haven’t lived until you’ve tried this RedWing Cafe speciality. 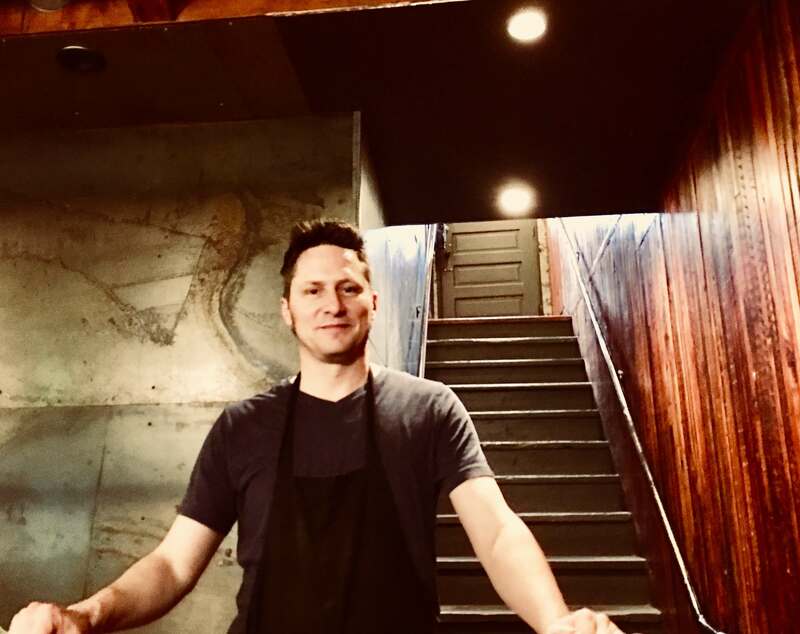 My apologies to the many people behind the scenes at RedWing Cafe that I either didn’t meet or have the opportunity to photograph; just know that you all contribute to creating a great dining experience and I thank you all sincerely. Tristan is just one of the great Baristas who keep the coffee coming in my direction. 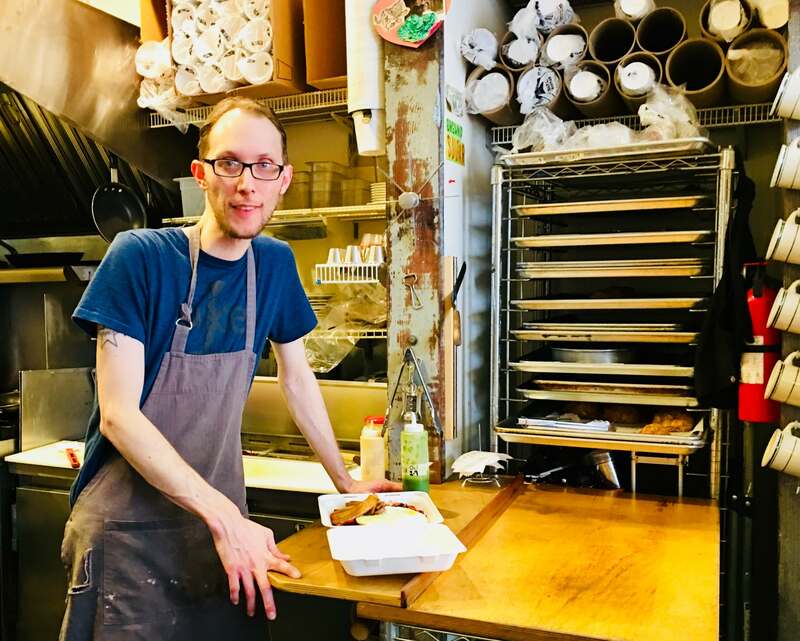 Judging by the people I meet at this amazing place, I’m not the only one whose life has been changed for the better by the staff at RedWing Cafe. 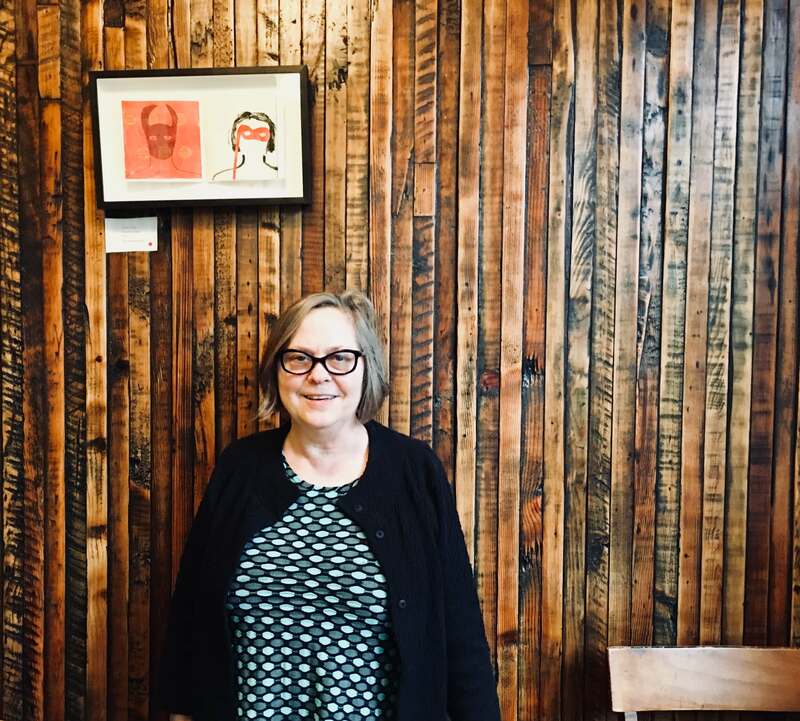 I may only be passing through Seattle for a short time, but I will be holding up each and every one of the inspiring staff of RedWing Cafe as a yardstick by which to measure cafes in the future. WordCamp Is Just Over A Week Away!!! Less than 2 weeks to go and I can hardly wait to get there!!! 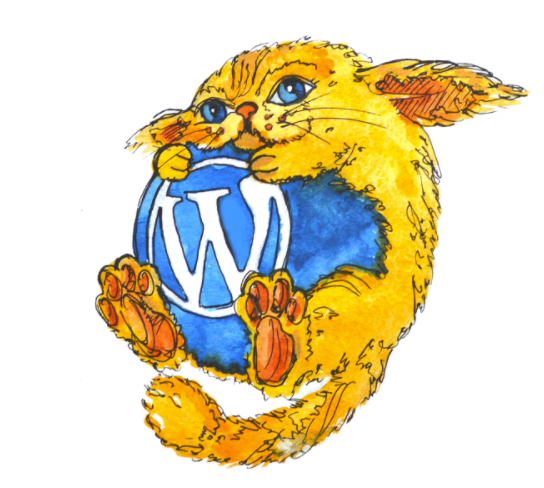 Why is WordCamp exciting? Because WordCamp is a two-day conference filled with inspiring speakers, generous sponsors and lots of like-minded people, and because the cost of this amazing event is incredibly low! In fact, you won’t believe how low it is. WordCamp is about WordPress, and WordPress is probably the easiest website building tool on the planet! WordPress has made the process so easy that even I could do it. You start by downloading the WordPress software script from WordPress.org, and you start building. You can have anything from a simple blog site – to a money-making online business site. The choice is yours. When I started on the journey of building a website in 2016, I booked myself into WordCamp Sunshine Coast (Queensland – Australia) for my first WordPress live experience. I was hoping to have a lot of questions answered over the two days – only to discover that I didn’t really have the questions clearly formulated – they were kind of swimming around in my head without any specific words attached. It’s kind of hard when you don’t know – what you don’t know. The one big question of ‘How do I Blog?’ was put on the backburner during the first few sessions at WordCamp, when I found out there are a lot more important things to learn before you get to the blogging stage. First I had to overcome my fear and just start building my sites and start my blog, even though I didn’t really know what I was doing. 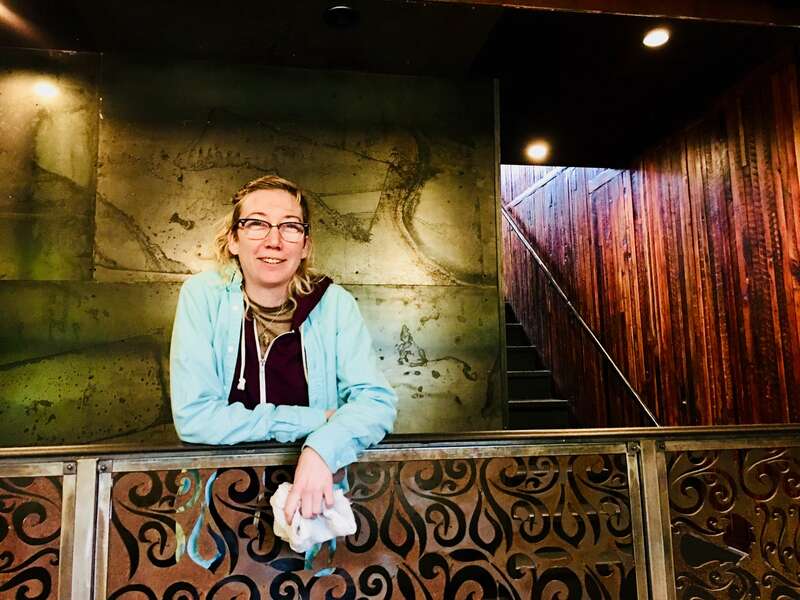 One of the outstanding presentations at the conference was a successful web designer who admitted her initial fear of building her first website, and how WordPress had helped her gain the confidence she needed to start building sites for others. I guessed the secret was to just roll your sleeves up, get in, and get it done, regardless of the fear. Why Would You Want To Go To WordCamp? Because these days, it seems that everyone has a blog. 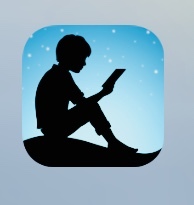 And thousands of people read them! When we are looking for information about a specific topic, we type a word or phrase into our favourite search engine and Oila!, more information than you can poke the proverbial stick at. And somewhere in those search results, we’re sure to come across a blog. Whatever it is that gets you fired up, you could be sharing it with the world, on your own website. What Does Building A Website Have To Do With WordCamp? When you buy your ticket to WordCamp Brisbane 2017, you are buying access to two-days of top-notch speakers (professional and newbies) who are well-versed in website building and sharing their stories about how they’ve progressed through the WordPress journey – the trials, tribulations and successes. The most inspiring are the ones who had no experience before building their first website and who, through WordPress, have gone on to build a successful blog or online business. Your WordPress site can be as easy, or as customised, as you want it to be. Over a coffee or lunch, you’ll be able to meet and mingle with the speakers and ask any of those questions you didn’t get a chance to ask in the sessions. You’ll also meet other attendees who are on the same web-building journey as you. Perhaps they have the same interests and can share tips and tricks to save you time and effort in your journey? You just need an idea of what you want to create and the time to ‘play around’ with the site until you develop what you need. The support provided by WordPress will have you sharing your web-address with family and friends in no time. WordPress online training will help you get started, and then lead you down the road of web-development until you reach your destination – your very own website for your blog – or maybe an online business. You don’t have to know anything about Code (HTML, CSS etc.) to build a website with WordPress. There are plenty of Themes, Widgits, and Plug-Ins that are built in or easily accessible. But I guarantee it won’t be long before you are wanting to tweak your site with a few extra quirky bits. I’ve recently discovered the value of adding a little code here and there, and I’m loving it. When you know a few basics, it makes the job a lot more fun. When you start building a website in WordPress, you become part of an extended family. While most earthly families get together over lunch on Sundays, or the family bbq, the WordPress family gets together at WordCamp. WordCamps are held around the world and provide support and encouragement at every level of your development, in all things ‘website’. From humble beginnings at the novice level, to the most accomplished web-design tools for professional web-designers; there really is something for everyone with WordCamp. 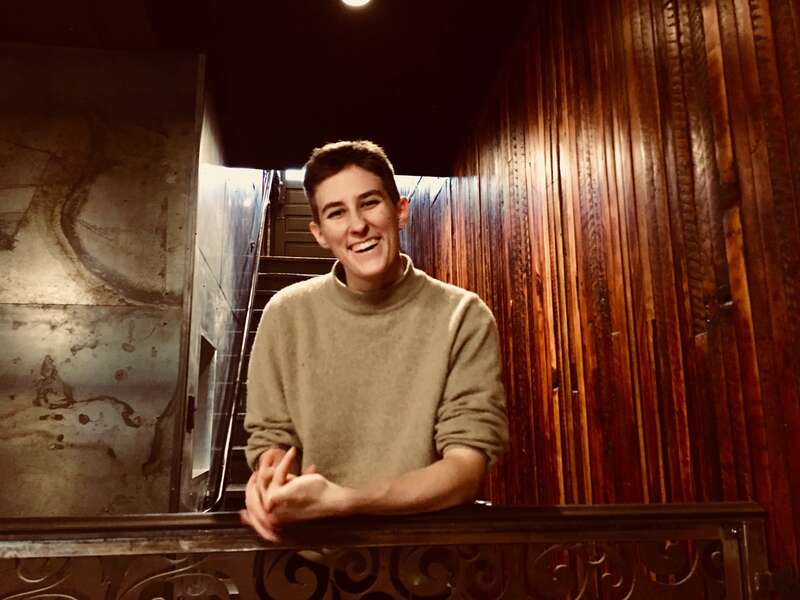 Basically a story about how opportunities can open themselves up to you when you make the decision to overcome your fears and anxieties and ‘Just Do It!’. Starting from the beginning of how he got into the WordPress centred career he’s in today, by punching his fears in the face and putting himself out there. Normally, a conference with such qualified and informative speakers would cost a fortune, but not at WordCamp. Value for money puts WordCamp way out in front. The Total Cost of WordCamp is just $50! Oh, and there are usually give-aways by the sponsors who proudly put their support behind this fabulous event. At time of writing – tickets to WordCamp Brisbane 2017 have sold out, but watch the site for a possible release of more tickets – no guarantees – but you might be lucky. See you online and at WordCamp! Bear with me as I learn the ropes of Blogging. The pages of this site are so much like the pages of my mind – ‘bits and pieces from here and there, all thrown together with reckless abandon’. If you have any compulsion to see the site organised in a more rational way, and the expertise to make it happen, contact me; I’ll take all the help I can get! Someone once made the comment that I was like a butterfly, flitting from one thing to another. They were so right. And all the memories I’ve made as I’ve flitted along are right here, scattered amongst the pages and posts. You just need to find them.